NEVER STOP BELIEVIN - Ultimate Journey Tribute! Early advance general admission tickets are only $18.00 until February 21st 2019. $20.00 through March 21st 2019. $22.00 through April 4th 2019. $25.00 at the gate, the day of. The earlier you purchase the more you save, as well as get the best seating! If you wish to sit in a group with others please be sure to buy the entire groups tickets at one time so we can be sure to have you together. If there are any special comments please be sure to make them when ordering your tickets. Like all our concerts, in order to seat everyone best, we reserved the assigning of seats based on the best available in the order in which they were purchased. Limited Preferred seating inside the great room at surfboard tables, but NOT in front of the stage, and first row of barrel tables behind VIP surfboard tables; $27.00. If you wish to sit in a group with others please be sure to buy the entire groups tickets at one time so we can be sure to have you together. If there are any special comments please be sure to make them when ordering your tickets. Like all our concerts, in order to seat everyone best, we reserved the assigning of seats based on the best available in the order in which they were purchased. Limited VIP tickets will also be available and include up front reserved seats (best available at purchase time), table snacks, and a drink ticket. VIP tickets are very limited and usually sell out quickly. A single show VIP ticket is $40.00 and are on a first come first serve basis. If you wish to sit in a group with others please be sure to buy the entire groups tickets at one time so we can be sure to have you together. If there are any special comments please be sure to make them when ordering your tickets. Like all our concerts, in order to seat everyone best, we reserved the assigning of seats based on the best available in the order in which they were purchased. 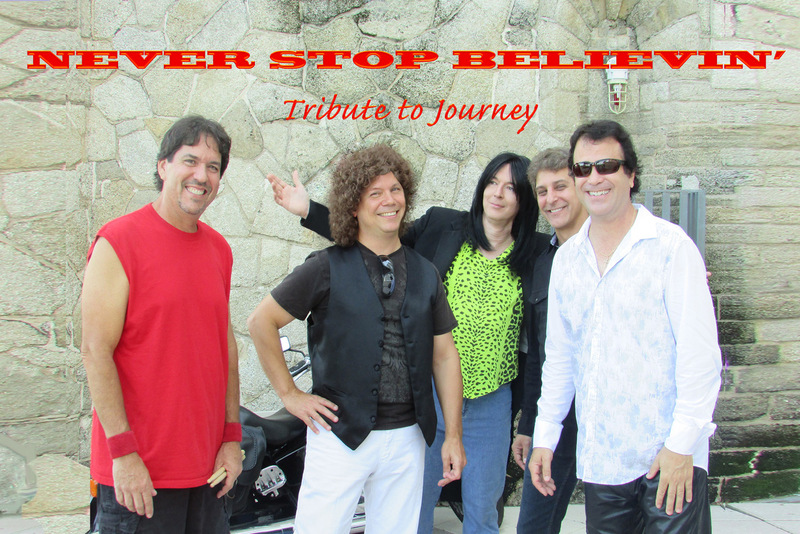 Journey Fans.. don’t miss NEVER STOP BELIEVIN’ as they perform the greatest hits of Journey in their prime years, from the late 1970’s throughout the 1980’s. Songs from Journey's chart-topping albums, including Infinity, Evolution, Escape, Frontiers, Faithfully, and Raised on Radio reflect the band as only their most avid fans will recall. From the vintage 70’s look, with bell-bottoms and big hair, to the classic analog synth sounds and, of course, Billy D Lindley’s channeling Steve Perry’s impeccable and unmistakable voice, NEVER STOP BELIEVIN’ replicates the look, sound and experience of Journey with both the precision and finesse of the original band and delivering the magic of the legendary live performances from their heyday. Gates open at 5:30pm with Opening music by Terry Dobson! Food available until 7:00pm featuring Creative Chef AND Taco Trap Food Trucks! Food available until 7:00pm featuring Creative Chef AND Taco Trap Food Trucks! As well as Summer Crush munchies like Old Florida chips with Summer Crush Salsa's, Macy's smoked fish dip with crackers, and a collection of products from Boar's Head including: Salami & Provolone Slices, Sopressota, Hummus, creamy Havarti, and Vermont cheddar. Food is not included in the ticket price.